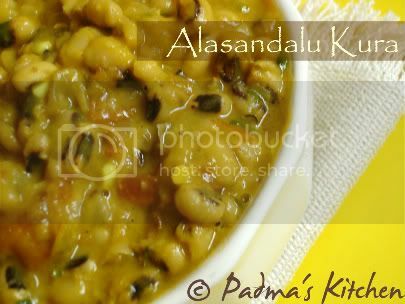 Alasandalu ~ Black-eyed peas or cow peas in English, also known as Bobbarlu in Telugu, Karamani in Tamil, Lobia in Hindi, Chavli in Marathi and Alasande in Kannada. Cow peas are a good source of Calcium, Folate and Vitamin A apart from protein and fiber, hence it is very useful to kids and, pregnant women also. 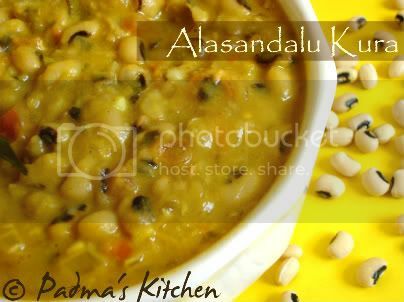 Soak alasandalu/black-eyed peas overnight or minimum for four hours. Wash them thoroughly and pressure cook them with two cups of water and a pinch of salt. Drain and keep aside. In a large pot or kadai, heat oil and add the seasoning: cumin and mustard seeds. Let it fry for a min and then add curry leaves and chopped garlic. Fry till the aroma of garlic fills the room. Add onions and salt to sweat them. Fry till the onions are translucent or turn pink for about 3 mins then add chopped tomatoes, green chillies and let them cook for 6-7 mins or till the tomatoes turn mushy mushy and starts to leave the oil. Lastly add the cooked black eyes peas/ alasandalu and stir well till as the ingredients are mixed well. Add turmeric and chilli powder and tamarind pulp/chintapandu pulupu to it. Check for salt, add half cup water and let it simmer on low flame till all flavors blend well. I am sending this to Cooking 4 all seasons for Curry Mela hosted by Srivalli. Hope this qualifies! I'm always up for some beans! Looks really yummy! mmm. delcious kura with alasandalu. so colorful. Cute coffee click too! really nice curry..very healthy.. like the post:-) love the coffee stain pic! hey Padma, how hv u been? black eye peas curry looks good. i love black-eyed peas and this looks creamy and perfect. I have something for you in my blog.. do check out!! I have some black-eyed peas in my pantry. I had no idea what to do with it. I should make this tasty looking curry! I love beans and lentils. Never prepared black-eyed beans this way. Looks good. Just read your comment question on this dish now that I am back from break. It's a beauty, Padma. Yes, please send it to me for My Legume Love Affair 2. W/in the next few days will be fine. I won't be posting the round-up until late this coming week, so no worries about today's deadline. Happy to have you on board. This recipe is to die for!!! Thanks padma for ur delicious recipe..i made it today it turned out yummy!! my husband really enjoyed it!! But the color wasn't like urs, maybe becoz i fried the spices before mixing the peas.. This looks DELICIOUS! So thick and creamy and I love bean dishes anyway. Great recipe! padma gaaru mee alasandalu tayaru chese vidhanam chakkaga chepparu chala thanks andi. One of the ingredients for your Black eyed pea curry is "Tamarind Pulp". Please excuse my ignorance (I'm new to making curries), but how do I make Tamarind Pulp? Can I buy already pulpped? Or does that need preparation as well? I have tried this recipe today and it turned out to be very tasty.I have used the black-eyed peas tin brought from the store. Thanks for the simple and easy recipe.